The Wisconsin anti-austerity movement drew on popular occupations around the world, and set the stage for Occupy Wall Street. “We Are the Beginning of the Beginning.” So read a hand-painted sign often seen in occupied Zuccotti Park. Every movement has its myths of origin. And many nonparticipant observers speak of Occupy Wall Street as if it emerged out of thin air, or out of cyberspace, in the summer of 2011. But the would-be occupiers of 2011 had watched, listened to, and learned from the example of their predecessors in other places. When I ask them what inspired them to occupy, many of them cite a long list of occupations of international dimensions. Just four days after the fall of Mubarak, a storm of unrest swept the American Midwest. The battle of Madison was no “American Spring,” as some had hoped. But like the Arab Spring, it had a powerful demonstrating effect on the thousands who participated and the millions who watched from afar. For many, the occupation recast the very meaning of US democracy seemingly overnight, calling its class dimension into question and reminding workers, students, and citizens of their power in numbers. Three years had passed since the onset of the Great Recession and the bailout of the banks. The change many had hoped for, worked for, and voted for in 2008 was proving ever more illusory. The nation’s political class had an answer to the crisis — austerity — but the cutbacks only added to the unemployment rolls. From August 2008 through 2010, state and local governments laid off more than 426,000 employees. This trend accelerated with the expiration of federal stimulus funds and the extension of the George W. Bush–era tax cuts, portending a deep fiscal crisis for many states and municipalities. At no time in living memory had the American labor movement appeared so demoralized, so demobilized. Union membership fell to its lowest level in seventy years. In most states the public sector was organized labor’s last bastion. Now, with the triumphant march of the Tea Party right into state legislatures nationwide, it seemed public sector unions were about to be next on the chopping block. On February 11, Scott Walker, the newly elected governor of Wisconsin and a Tea Party favorite, proposed a reactionary Budget Repair Bill to deal with a manufactured fiscal crisis. The legislation sought to strip the state’s public sector workers of the right to collectively bargain over wages, benefits, and working conditions — a right that had been enshrined in state law for more than half a century. It would also require annual union certification votes, and give the governor the right to fire any state employee who elected to go on strike. In response to a firestorm of criticism, Gov. Walker replied, “I don’t have anything to negotiate” and threatened to call out the National Guard in the event of a work stoppage. 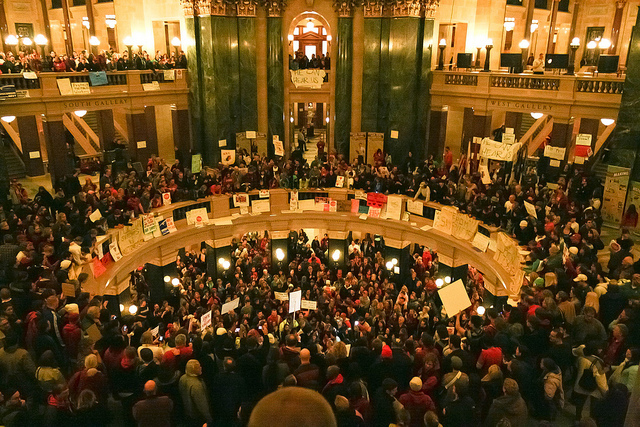 The next night, inspired by the revolutions overseas, the Teaching Assistants’ Association of the University of Wisconsin–Madison spearheaded an overnight sleepover in the capitol rotunda. Much to everyone’s surprise, the occupation stretched on for seventeen days, culminating in the largest demonstrations in the state’s history. In the beginning, the crowds were largely composed of students and teachers, some of whom staged wildcat strikes and “sickouts” so they could take part in the occupation. As the days wore on, the movement broadened its base to include workers and citizens of all stripes, regardless of whether they were personally affected by the Budget Repair Bill. Here were non-union, Wisconsin taxpayers singing “Solidarity Forever” alongside their union brothers and sisters. Here were angry members of the International Brotherhood of Teamsters, offering brats to all who were hungry and staging “solidarity sleepovers” alongside service workers, steelworkers, and even off-duty police officers and firefighters in full regalia. When I got there, oh my god . . . it was the most amazing thing. The whole rotunda was filled with people shouting in unison and seeing first hand, for real, what democracy looks like, and how flawed our democracy is. I saw college students and grad students and teachers and firefighters and police officers and farmers and janitors and city workers. . . . People were waiting in line, lines upon lines, to give their own personal statements about how important unions are . . . testimonies by the thousands. We meant to go there for one day, and we just stayed [for two weeks]. Out-of-state allies called in thousands of pizza pies to feed the occupiers, with donations streaming in from all fifty states and from fans as far away as Haiti, Ecuador, and Egypt. The occupiers benefited not only from the “pizzatopia,” but also from a medical station, information station, daycare center, and other services on demand. After dark, the program continued with performances, workshops, and discussion groups. By night, upwards of four hundred occupiers spread their sleeping bags across the marble floors and prepared for their next day of action. Outside the rotunda, tens of thousands regularly paraded up and down the capitol grounds, trooping through the snow, the ice, and the fog of the bitter Wisconsin winter. By February 24, the protests had spread to eighteen other towns across the state, while “Stand with Wisconsin” solidarity rallies had become a common sight in other parts of the country, along with garden signs and online memes featuring a map of the state in the shape of a fist. The campaign to “kill the bill” had tapped into a wellspring of discontent with the austerity agenda and the drive to dismantle the nation’s unions. Having won the backing of local and national publics, the Madison occupiers forced a dramatic showdown in the legislature, as fourteen senators fled to Illinois in an attempt to preclude the vote. In the end, however, despite the historic mobilization, Walker and his allies were able to force the collective bargaining bill through the legislature, in the dead of night, on March 9. In the short term, the occupiers would lose their fight against austerity in Wisconsin. Walker would emerge triumphant from a failed recall election, while the public sector unions would shed more than half their membership over the next four years. Yet Wisconsin was the opening shot in the contest over who would bear the costs of the crisis and who would reap the benefits of the recovery. And the People’s House was to be a proving ground for many of those who, months later, would form the core of OWS. It was there, in the occupied rotunda, that Americans would catch their first, fleeting glimpse of the intergenerational alliance that the 99 Percent Movement convened: older, unionized workers side by side downwardly mobile Millennials. In the age of austerity, both social strata were being asked to bear the cost of a crisis they had had no hand in creating. And both strata were facing the prospect of losing the social rights and living standards that earlier generations had taken for granted. In the days and months that followed, hope for a more democratic society, hostility toward “corporate tyranny,” and a loss of faith in other avenues of political action would combine to turn growing numbers of Americans in favor of the strategy of civil disobedience in general, and the tactic of occupation in particular. We are the 99 percent. We represent New York — unfortunately, our Governor does not. Join . . . the 99 percent to demand a state budget that meets [our] demands. Mr. Cuomo, You’ve got five days to decide whose side you’re on . . . the 99 percent or the 1 percent. The clock is ticking . . . and the 99 percent will not wait in silence. Six months later, on September 17, 2011, thousands would spill into the streets of New York City’s Financial District and feed into a single, raging stream bound for Zuccotti Park. The occupiers of Liberty Square (as they rechristened it), like the occupiers of the People’s House, would organize their efforts around a strategy of civil disobedience, aimed at confronting, disrupting, and delegitimizing the workings of business as usual in the capital of capital. In the process, they would move to extend the scope of the occupations to the institutions responsible for the economic crisis, turning it into a political crisis that would echo from Wisconsin to the gates of Wall Street. Michael Gould-Wartofsky is the author of The Occupiers (Oxford University Press, 2015) and a PhD candidate in the department of sociology at New York University.